Awww, our little kitty-cat is growing up so fast. Yes, OSCiLLOT has had another growth spurt and the latest update to Max for Cats’ modular synthesis system introduces a pair of highly advanced oscillators and an incredibly useful multichannel output. See and hear them demonstrated in the video below. The Wave X oscillator module has 5,504 individual wave cycles, organized as 128 smoothly morphing waves, in 43 sets. The 43 morphing sets include harmonic shapings, filter sweeps, vowel formants, and randomized loops for individual wave cycles. The other new oscillator is the 'Swarm' – and this one definitely lives up to its name. Seven sound generators with four different waveforms can be detuned, randomized and modulated for a vast variety of thick, rich tones. 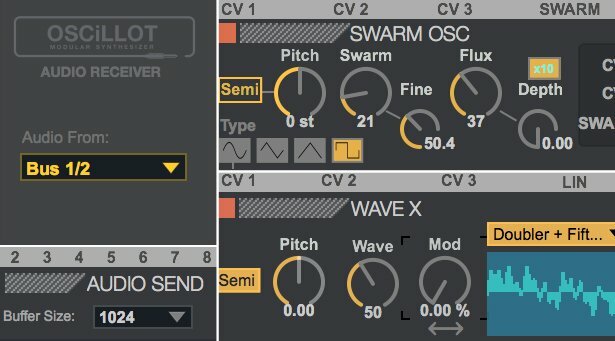 The Multichannel Output module promises to make things even more interesting in terms of integration with the rest of your studio by giving you the ability to route up to 8 audio streams from OSCiLLOT to individual audio tracks in Live or to multiple outputs of your audio interface – perfect for controlling external hardware synths with CV from OSCiLLOT.